Lock in a great price for Holiday Inn Calais – rated 8.2 by recent guests! A great location facing the harbour. The staff were all very pleasant. There are a number of restaurants in the area. Convenient place to stay if you want a night in Calais. Friendly receptionist. The room was very comfortable apart from the smell of cigarettes, it was unfortunate that we were on the second floor which is a smoking floor, I will ask for any other floor in the future. Meets expectations in terms of a low cost clean place to stay. Easy location as a stop over into deeper France. Friendly helpful staff. Bed very comfortable, food reasonable, staff extremely kind and friendly, hotel clean and comfortable....a great place to stay overnight. We have stopped here 4 times it is convenient stopover for our journey home. It is a chain hotel and is mainly used for business people so no frills but suits us. The room was cosy and a good size and good views - near the port. This destination was a stopover on our way home. Will definitely stay their again. Lovely spacious rooms. We had a problem checking in and they resolved it straight away. i had driven from amsterdam and wanted a nights rest somewhere quick, easy and affordable near the eurotunnel. i was expecting adequate but i got sao much more, the staff were very helpful, professional and friendly. my room was comfortable and there were food options on ground floor. i checked out feeling very impressed and pleased at getting much more than i expected and paid for. 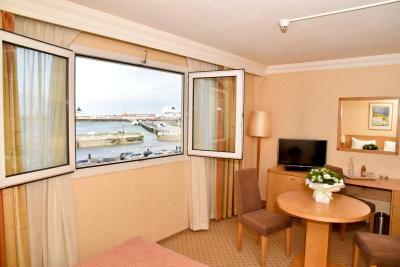 The Holiday Inn is located close to the beach in Calais, a 15-minute walk to the city center. It offers free internet access, private on-site parking and easy access from the ferry port. The Eurotunnel terminal is a 10-minute drive away. Composed of single, double and family rooms and suites, the Holiday Inn Calais provides comfortable air-conditioned accommodations. All rooms feature tea and coffee facilities, a desk, an private bathroom with a bath or shower and a hair dryer and a flat-screen TV with satellite channels. Start the day with the buffet breakfast, which is free for children aged 13 years old or less. The restaurant offers a view of the harbor and a wide variety of French dishes for dinner. In the hotel bar, you can enjoy a drink while entertaining friends or family. Room service is available until 22:30. The Holiday Inn is ideally placed to enjoy all that Calais has to offer, and the A16 and A26 motorways are close by, giving easy access to Belgium and Paris. Guests may park their car free of charge in front of the hotel, upon availability. The Lace Museum is a 15-minute walk away and the casino is a 3-minute walk from the hotel. When would you like to stay at Holiday Inn Calais? This air-conditioned room has a flat-screen TV with satellite channels, and free Wi-Fi. Guests are permitted to smoke in Standard Rooms. The attribution of a nonsmoking room is subject to availability. 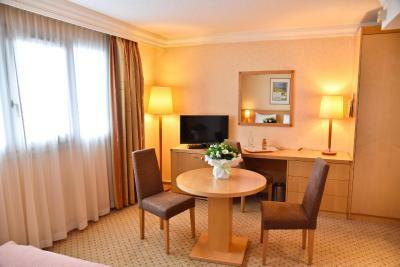 Free Wi-Fi, a mini-bar and tea and coffee making facilities are provided in this larger room. There is a flat-screen TV with English channels. Including free Wi-Fi, this air-conditioned room features a bathroom and a TV with satellite channels. Free Wi-Fi, a mini-bar and tea and coffee making facilities are provided in this room. There is a flat-screen TV with English channels. This room features 2 bathrooms, a separate sitting room, 2 TVs with satellite channels and air conditioning. It also has free Wi-Fi. This suite features views of the fishing harbor, a separate sitting area and complimentary mineral water and fruit. It also has free Wi-Fi. This double room features a mini-bar, a satellite TV and a courtesy tray. Free Wi-Fi access is available. Please note that the attribution of a nonsmoking room is subject to availability. 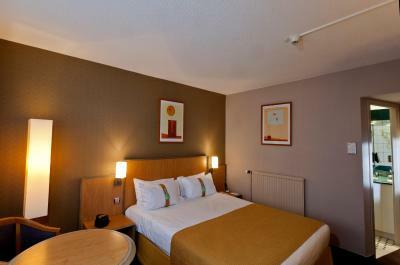 Holiday Inn Calais is part of PREM Group. Established in 1996, PREM Group is a fully owned Irish company in the business of operating over 35 hotels and serviced apartments across Ireland, the UK and Europe. For Europe head office is located in Gent under the name PREM Group Benelux & France Division. The number one priority within each one of our hotels is our personal service towards our guests as well as our customer care. House Rules Holiday Inn Calais takes special requests – add in the next step! Holiday Inn Calais accepts these cards and reserves the right to temporarily hold an amount prior to arrival. Please note that from 1 September 2018, the hotel will be entirely nonsmoking. If you plan to arrive after midnight, please contact the hotel directly for instructions regarding late check-in procedure. Children under 13 years old can enjoy breakfast for free. Please note that the restaurant will be closed the following evenings: 24, 25, 26 and 31 Decembre 2018, as well as the 1 January 2019. Very nicely cooked English Breakfast buffet but the French way! Breakfast could be better. Some items didn’t look too fresh. Most cooked food at breakfast looked unattractive. Location close to restaurants & shops. Comfy bed. Good view of harbour. Great location, friendly and helpful staff, nice room, clean and comfortable. The hotel looks very tired and in need of refurbishment. The flush needed to be worked multiple times before the toilet obliged. We were very keen to get a safe parking but they had said they could not reserve it, it was first come first served. So we hurried to arrive at a decent hour. on checking in we were told that they had no covered parking, that we should take a street parking. Yet as I kept insisting on needing a parking, it seemed they had a garage free after all!! It should have been offered to us immediately on requesting, why was it not? Location. Close to restaurants. 15 min drive to the tunnel. Private parking. Nicely sized rooms. Very comfortable beds. Decent breakfast. View over the harbour and beach - stunning. Clean room. Good food. The restaurant was closed due to staff unavailable, poor. Very good overall for the price. Helpful check in. Girl behind d bar . Did not eat in restaurant, as advised food not great. Great view of harbour. Good value for money and honest reliable staff. Left my jewellery in the room and they have found it and arranging to send back to me!